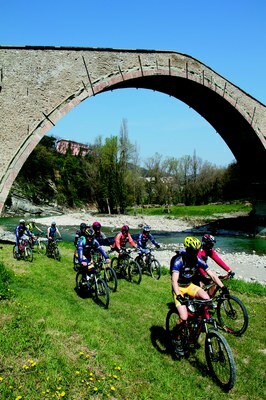 Paths for mountain bike and trekking allow to appreciate all-year a beautiful and clean environment. From the town of Castel del Rio towards Guasteto, a road uphill which leads along the ridge between the Senio and Santerno rivers. Take the road on the ridge up to the church of Valmaggiore; at the crossing before the church turn left for the road that leads to Baffadi and SP306. Follow for a short distance in the direction of Casola Valsenio, then turn left towards San Ruffillo, where you can reach the fortress of Monte Battaglia. The route allows you to see the Rock of Monte Battaglia (XIV sec.) where, in September 1944, Allies and italian Partisans fought against the Germans. Itinerary: Castel del Rio - Baffadi - San Ruffillo - Rocca di Monte Battaglia - Castel del Rio. From Castel del Rio climbs the SP Montanara up to Coniale, then turn left following the indication for Palazzuolo and get along a climb of around 10 kms, up to Passo del Paretaio (mt 1.000). Turn left to Bibbiana and then Prati Piani. From here you continue along a road up to Ca 'del Gobbo. You then go down through the Fontanelle, up to the ruins of Cantagallo castle. Then the road leads quickly to the Bridge Alidosi and to Castel del Rio. Along this route there are many points of historical interest, including the famous bridge and the ruins of Castle Cantagallo, a defensive structure built for defending Castel del Rio. Itinerary: Castel del Rio - Coniale - Passo del Paretaio - Prati Piani - Ca 'del Gobbo - Cantagallo - Castel del Rio. From the town of Castel del Rio, crossing the bridge, you reach the road Guasteto which leads to the ridge between the Senio and Santerno. Bike along the ridge road in the direction of Monte Battaglia. Follow the road for about 2 km towards Casola and then turn left onto a dirt road. You go through the chestnut woods and you enter the SC Campiuno which leads to Tossignano. From here you reach Borgo Tossignano and back to Castel del Rio along SP 610 Montanara. Particularly notable is passing through the chestnut woods at Campiuno. Maximum height: 700 m (Monte Battaglia). From the church of Montefune climb along a trail to Mount Pratolungo. Turn left and you reach the top of Mount La Fine (993 mts above sea level). Go down and turn left towards Il Poggio. Through a chestnut forest, descend to the village of Paroncellina and then reach the campsite Le Selve. From Paroncellina you can also go to Montefune along a shortened path (path 727 / A). Itinerary: Montefune - Pratolungo Monte - Monte La Fine - Il Poggio - Paroncellina - Camping Le Selve - Montefune. Just beyond Giugnola, walk along a road that touches Villa Rosa and leads to Sillaro river. Cross the river on a footbridge and then up to Sassalbo. Follow the watercourse. A steep climb leads to Ca 'di Moro where you turn left to go back near the starting point. The path (CAI 723) leads to many springs and fountains. The most impressive stretch of the route is the narrow gorge that springs Rio Zafferino before emptying into the meadows. In this area you find a tower and other old buildings. On the way back you can see other interesting houses in sandstone. Itinerary: Giugnola - Doccia - Torrent meadows; - Rio Zafferino - Sassalbo - Giugnola. From the church of St. Andrew, a long climb leads to Monte Pedina and Lama dei Ronchi. Downhill along the cliffs of sandstone, you get to Castiglioncello. Then return back to the east, following a small road up to St. Andrea. The path (CAI 717), rather attended, crosses through thick copses and great chestnut trees. Very impressive is the ghost town of Castiglioncello, around 300 inhabitants that abandoned it in 1950s. Itinerary: Sant'Andrea - Monte Pedina - Lama dei Ronchi - Poggio La Cornia - Castiglioncello - Ca 'Fanti - Sant'Andrea.